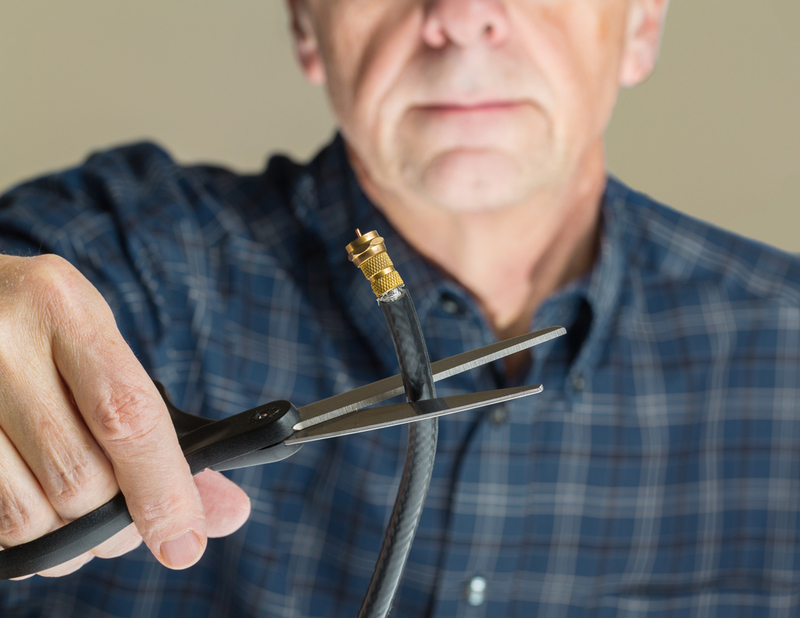 Caregiver Cheat Sheet: Break Up With Cable! The newest trend in television is breaking free of your high monthly cable bill by cutting the cord, and going completely cable-free. Not ready to go TV-free? The good news is that you can get the shows you want without paying for all those channels you never watch. Seriously, how many ESPNs are there? Whether you consult a ‘cord cutting consultant’ – an entrepreneur who will guide you through this relationship transition – or you do it yourself, you can ditch cable and still watch as many hours of TV as you can handle. The only way you don’t win in this scenario is if you own stock in Big Cable! So, how do you take the plunge? First, don’t pull an Elvis – you still need your TV. However, there are many ways to configure your new entertainment setup, and most of the particulars depend on which channels you have to have. Live sports, premium movie channels, basic network, foreign language – it’s all available, it’s just a matter of how you subscribe to it. The benefit here is that you will pay for the channels you plan to watch, not the channels that Big Cable deigns to throw together into a package for you. Let them eat ClooTV, indeed. The basic components are: screen, internet connection, device that connects the screen to the internet, and streaming services. Screen: That’s an easy one. You probably already have a TV. However, if your TV is older than the average Disney Channel star, it might not have an HDMI port. HDMI is the digital connection that most devices use now, and HDTV is the crisp quality that makes everything vintage seem weirdly fuzzy. And if you go with a digital antenna, and you only have an analog TV, you may need to upgrade to an HDTV with HDMI. Internet Connection: You need a good internet connection, or you will spend the rest of your days in buffer limbo. Each device will have a recommended minimum, but you will need at least 1.5 Mbps download speeds, and at least 3Mbps if you want to watch live sports. If this is more than you currently have, remember, an upgrade will still be cheaper than what you’re paying for your TV package. Device: You can stream digital content to your TV through Chromecast, an Apple TV, a Wii, an Xbox 360, a PS3 or PS4, an Amazon Fire TV, Google Nexus player, or a Roku, among others. You may already have one of these devices in your home for gaming or music. If you have none of these, I personally suggest any of the Roku models. They are the closest thing to plug and play I’ve seen, and you don’t risk connecting anything embarrassing from the cloud to your TV screen. But…football? : Maybe you’re convinced, and you’re ready to pull some plugs. Or maybe you’re looking for the biggest reason cable subscribers stick around – live sports. You have options. If the digital antenna works for you, you can watch every football game your neighbors do on Sunday, in digital HD. If some other sport is your life, most of the major sports leagues now have live streaming packages, and Sling TV streams ESPN, for the news. Today, TV, streaming video and movies are available almost anywhere, with no cable subscription required, if you have enough internet bandwidth. The average basic cable bill grows an average of 6.1% annually, and is currently more than $65 a month. Do you see why the pay-TV industry has lost more than 2.2 million customers since 2013? And it’s easier than ever to join the cord-cutter club without abandoning your big-screen HDTV for a tiny screen or awkward device. You may have to buy a new TV, or a new streaming device, or even a new digital antenna – but these are all one-time purchases that will quickly pay for themselves as you enjoy your freedom from cable servitude. Cut the cord, Braveheart!